Losing weight or getting in shape seems to be on just about every other person’s to-do list for the new year—and if it’s on yours, you may already have a great workout partner: your pet! Just like humans, overweight pets are more likely to develop diabetes, osteoarthritis, high blood pressure, heart disease, joint injuries, and cancer. According to the Association for Pet Obesity Prevention, 59% of cats and 54% of dogs in the U.S. are overweight. Measure your pet’s food to make sure you’re not overfeeding. Try interval walking/jogging with your dog instead of just a simple walk. You’ll both burn more calories and it makes the walk more interesting for your pet. Play hide & seek with your dog. Put him in a “sit/stay”, hide somewhere in the house, then call your dog to you. Reward with small treats and praise when he finds you. Spread meals out throughout the day (but make sure the total amount fed for the day is the correct amount). Instead of a game of fetch, play “catch me” with your dog, rewarding him with the ball when he tags you. Try agility! This obstacle-course-based activity is hugely fun for dogs and is quite a workout for their owners as well. As with any exercise program, it is good to gradually increase activity and not over-do and some pets may be limited in the type or quantity of exercise they can handle. 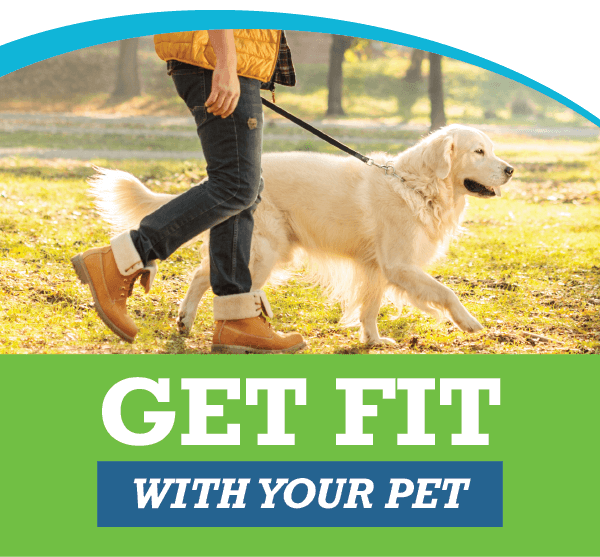 We can assist you in weight management for your pet and answer any questions you have about activity and exercise—just call us at 404-991-2943 to schedule an exam.